A Viennese-themed program of music for string trio from the eighteenth and twentieth centuries, along with the perennial romantic favorite, Schubert’s “Trout” Quintet for an ensemble enlarged to include double bass and piano performed by guest artists Donald Palma and Larry Wallach. 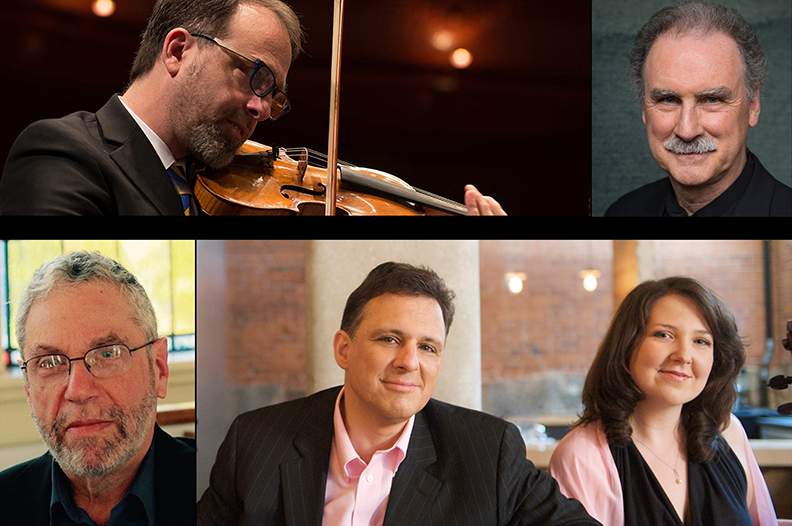 Founded in 1997, the Boston-based Walden Chamber Players has garnered a reputation for being one of the most exciting and versatile chamber groups performing today. Critics have hailed its performances of everything from Bach to Schoenberg, and Chamber Music America Magazine raves: “A season spent with the Walden Chamber Players is a time for discovery." The success of its performances, recordings, and educational curricula has earned it a place as one of the most sought-after chamber ensembles in the United States. Donald Palma has an active career as a double bassist, conductor, and educator. A native New Yorker, Don attended the Juilliard School and at the age of nineteen joined Leopold Stokowski’s American Symphony. As a member of the newly formed new music ensemble, Speculum Musicae, he went on to win the Naumburg Competition and secure management with Young Concert Artists. A founding member of the Orpheus Chamber Orchestra, Don has toured the globe and recorded over fifty compact discs, including the Grammy Award-winning Stravinsky CD, Shadow Dances. As a performer devoted to contemporary music, he has played and conducted dozens of premieres and recordings of important works by composers such as Elliott Carter, Mario Davidovsky, Charles Wuorinen,and Robert Ceely,among others, many of whom have composed works for him. He is Music Director of the Symphony by the Sea in Beverly, MA and appears with the Lincoln Center Chamber Music Society, the Da Camera Society and is a member of Mistral and the Walden Chamber Players. Don is on the faculty of the Yale School of Music and the New England Conservatory, where he directs the NEC Chamber Orchestra. Larry Wallach is a keyboard performer on piano and harpsichord, composer, musicologist, and professor who holds the Livingston Hall Chair in Music at Bard College at Simon’s Rock in Great Barrington, Massachusetts where he has taught since 1972. As a performer, he emphasizes chamber music and song accompaniment, and has collaborated with Nancy Bracken and Ronald Barron of the Boston Symphony, the Avanti Wind Quintet, John Cheek, Daniel Stepner, Stephen Hammer, Lucy Bardo, Paul Green, Susanna Ogata, Allan Dean, Maureen O’Flynn, the Berkshire Bach Society Chorus, Crescendo, Anne and Eva Legêne, and Ronald Gorevic with whom he recently performed all of Brahms’ sonatas for violin and viola. Walden presents a new concept of a classical concert both in content and presentation. Drawing from a rich palette of sources and styles, it mixes and matches the works of both classical and contemporary composers with an eye to new understandings and discoveries. Concerts often feature the use of multi-media and dialogue, giving the audience a broader appreciation of a certain time period and enabling the listener to make a connection between the artist, the creative process, and society-at-large--often mutually influencing forces--thereby creating a richer context. South Berkshire Concerts at Bard College at Simon’s Rock attracts renowned and emerging performers from around the world who represent a dynamic variety of traditional and inventive programming. Launched over 45 years ago at Simon’s Rock, the South Berkshire Concerts epitomize the college’s commitment to intellectual dialogue, creative expression, and service to community. Students and the public are exposed to a range of musical experiences, and often engage directly with the musicians during robust Q&A sessions.